I had the opportunity to do something fun today with my friend Holloway Sinclair and two of his five sons, Paul and David. 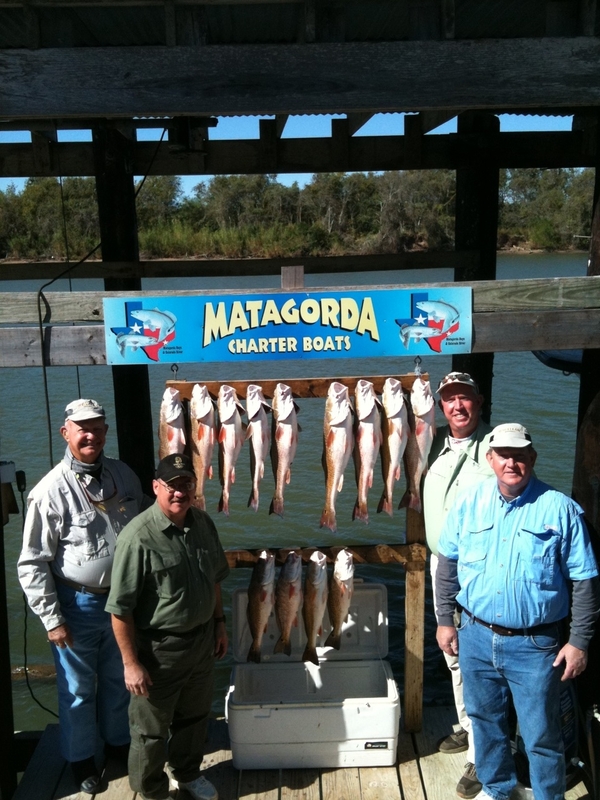 Earlier this week, Holloway invited me to join him and his sons on a guided fishing trip to Matagorda Bay. It’s not often that I can find the discretionary time to accept such a nice invitation. But, this week things worked out for me to accept Holloway’s invitation. And, I’m glad I did. We headed to Matagorda at five o’clock this morning to meet Captain Keith Phillips of Red Fish Matagorda. Keith is an experienced guide and outfitter who guarantees that you will catch fish. And today, we caught fish — lots of fish. In fact, we caught our limit of red fish in a little more than an hour and then spent the rest of the morning catching and releasing everything else we caught. We had a blast and a great time of fellowship together! I enjoyed the opportunity to meet Keith. I was intrigued by the boldness of his “no fish, no pay” guarantee until I watched him in action. He knows his stuff and he knows Matagorda Bay. He scanned the environment like a doctor scans an x-ray and led us with surgical precision to the perfect fishing spot. He knew exactly what kind of bait we needed and where to cast our lines. He watched every twitch of our fishing rods and often alerted us to get ready for a strike. He was right every time. Today’s fishing experience was enjoyable because we were led by an expert guide. There is no way we could have navigated Matagorda Bay or caught as many fish without the help of someone like Keith. I was reminded today of the valuable service that guides provide. They are the unsung heroes of adventure and travel. I have been out of the country thirteen times in the past twelve months. Every time I arrive at an international destination I depend on the services of a local guide — someone who knows the lay of the land, who can help me to accomplish my objectives, and who can keep me safe. I have also learned over the years that my travel is enriched when I meet the right guide. Once while visiting Machu Picchu, the breath-taking World Heritage site in the Andes Mountains, I met a man who had been a caretaker there for more than thirty-years. After I had taken the official tour of the site, this gentleman gave me and a friend a look at the nooks and crannies that most tourist don’t get to see. His knowledge of the site made my experience at Machu Picchu more meaningful. I was also reminded today of the valuable services that guides provided to the Apostle Paul on his missionary journeys. On Paul’s second missionary journey, his life was threatened at Thessalonica and then at Berea. So, the folks at Berea arranged for Paul to be escorted to Athens. Acts 17:15 records, “Those who escorted Paul brought him as far as Athens, and after receiving instructions for Silas and Timothy to come to him as quickly as possible, they departed.” When Paul’s life was in danger, some unnamed individuals guided him from Berea to Athens. These guides knew the best route to safety for the Apostle Paul. They performed a valuable service that enabled Paul to continue preaching the gospel and planting churches throughout the Mediterranean world. These selfless individuals got caught for a few seconds in the spotlight of Scripture but their names do not appear in the program. They are among the unnamed and unsung heroes of the Bible. I had a great time with Holloway, Paul, and David today. Our time together was enriched and made more enjoyable because of the services of our guide, Captain Keith Phillips. And, I am grateful to Keith and to all of the guides who have helped me to live adventurously over the years. I’m glad to reading this post, good to see you all, in the pitcure! Thanks for sharing. Thank you Omar, for being such a great guide for us who have been privileged to serve with you. I second Terry’s comment! I will never forget the trip to Mongolia under your leadership. I couldn’t tell you how many times I have told someone about your gift of missions ministry. You are an exceptional guide and I am so blessed to have met you and traveled on one of your teams. Thanks for your kind words. I am glad that we had the privilege of serving God together on mission in places like Tanzania and Mongolia. Thanks for loving God and the nations and for your willingness to Go Beyond!